Blood tracking all over the world – and the right gun for the job: The Polish town of Opole (Silesia) is home of the 40-year old university lecturer, hunt journalist and equipment tester Lukasz Dzierzanowski – with his Bavarian mountain hound Dozent he completes 40 blood tracks a year. Frank-Wolf Dahlem is forester in Hanover and one of Germany’s most experienced blood tracker. His Hanoverian bloodhounds go by the names of Brix and Ali and the team respond to between 200 and 250 blood tracking a year. In action, both hunters use the Helix Tracker. Hunters are often embarrassed about having to call in a tracking team – what can be done to make your work easier? Frank-Wolf: I take a pragmatic approach. I ask them please not to call between 10 pm and 6 am, after all, it’s a blood tracking and not a night trekking. And besides, a tracking team also needs to sleep. We will be there by first light, it makes sense then. Lukasz: We do exactly the same. It is far too dangerous at night. A safe shot is not possible and no-one wants to meet a wounded wild boar in the dark. If the game is not lying in the field of vision, every hunter automatically goes to where it was shot. Do you find that’s okay? Frank-Wolf: The hunter should know the place where the game was hit and how it reacted after the shot. In principle, there is nothing wrong with ‘taking a look’, provided the area is not trampled down. Lukasz: It is a decision that has to be made on a case by case basis. 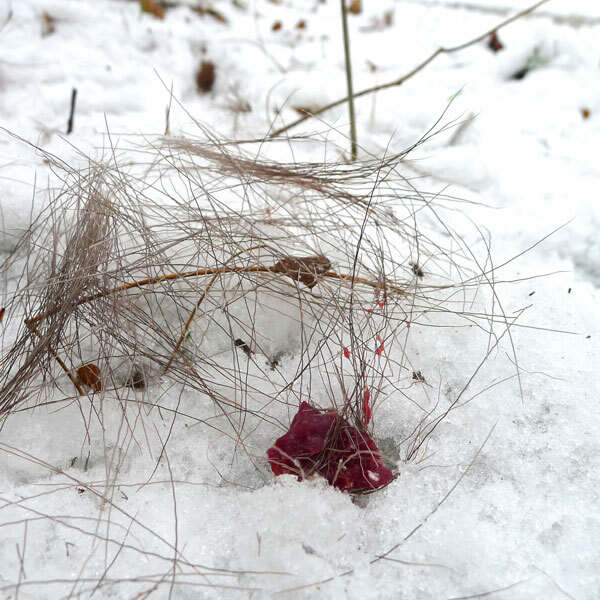 Point of impact, type of hair, reaction of the game and how it left the area – these factors influence the decision whether and how an animal should be tracked. Frank-Wolf: I’d just like to add something: I prefer to interpret the reaction of the game by myself, without preconceived ideas. Generally speaking, this means the blood tracker has more experience. It can be compared to going to the doctor: you should describe the symptoms but leave the diagnosis to the doctor. Is there a general rule for blood tracking? Frank-Wolf: I wouldn’t say a general rule. I would recommend calling in the tracking team if a deer or boar is not lying and there is no perceptible blood track. Irrespective of what was found at the place the animal was shot. I once tracked a stag that kept going for miles after a clear shot to the lung. It’s a different matter altogether with a less gun-hard deer, even more so if you have a more or less decent gundog to search the area. But you don’t usually get very far without a dog’s nose. What is blood tracking procedure? Frank-Wolf: Once the tracking team has arrived, it begins where the animal was hit. It is decided who has to give the coup de grâce: always the blood tracker, never the local attendant. There have been some unpleasant incidences in the past, for example, when one of the hunters pulled a revolver out of the bag, or someone suddenly walked in front of the barrels’ muzzle. Lukasz: Hunters in Poland don’t have handguns. Personally, I also find it too much hassle. GPS, rifle, leash, knife, dog – and then a handgun that you have to keep practicing. The short rifle is safer and the Helix TRACKER can easily be carried like a backpack thanks to the double sling. I take a similar view. You also have to be able to use your rifle proficiently. For safety reasons alone the coup de grâce must be the prerogative of the blood tracker – everyone else is unarmed. I carry my short Helix TRACKER and a long hunting knife. What is your opinion of the helix as a tracking rifle? Frank-Wolf: I was sceptical at first because of a small detail. The bolt handle is in this guide rail and it is open. We tramp through thick underbrush with the rifle and I found it hard to imagine that needles and twigs could drop into it and not interfere with the function of the rifle. Frank-Wolf: Surprisingly not. Anything that falls into it, also falls out again, or at least does not interfere with the function. It is a really rugged rifle, one you can rely on. I use an Aimpoint micro sight – it goes well with the rapid, short Helix Tracker. I found the plastic stock was too light for the 9.3 x 62 cartridge so I bought myself a less sensitive laminated stock, this has more weight and dampens recoil. Apart from that, I prefer to use wood and also find a laminated stock aesthetically more pleasing. Lukasz: I really liked the rifle during the tests. I have been carrying the same calibre rifle as my colleague for over a year now, also with an Aimpoint, and have had no problems with it. I also use the Tracker on driven hunts, but then usually with a scope. This is the strongest argument in my opinion as a blood tracker. The loaded gun can be carried safely thanks to the hand-cocking system. Or, put it in another way, I sold my double rifle – the Helix is simply more practical. Without wishing to flatter, it’s a tough job, but you are doing it on a voluntary basis. What would be your reward for turning out? Lukasz: Oh, not everything is about money. There really is a lot of work, sweat and effort involved. You are sometimes out for three, four hours at a time, sometimes to no avail. You know, one is not always rewarded with success. Frank-Wolf: In Lower Saxony we travel up to 80 kilometres, that costs petrol. We walk for miles – I sometimes get through two pairs of Wellington boots a year. And, even though the dogs and I really enjoy tracking, every team is glad of a little pin money – even though we find it just as hard to name a price for our services as do our clients. Are we talking about 50 or 500 euro? Lukasz: It’s a question of etiquette. At home in Poland the tendency is toward 50 euro. Frank-Wolf (lacht): Exactly. That covers costs and is a small sign of recognition. 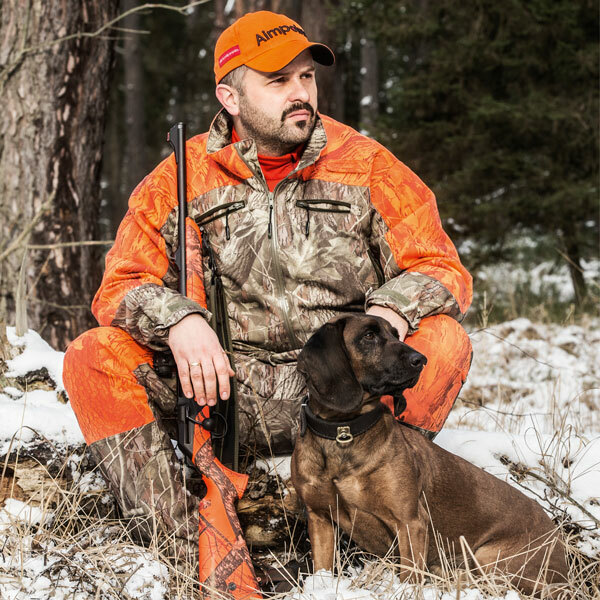 The 39 year old Lukasz Dzierzanowski lives in the polish Opole (Silesia) and is a high-school teacher, hunting journalist, gear tester and bloodhound expert. With his Bavarian Mountain hound he completes around 40 blood tracings per year. Always with him: His Helix TRACKER. Lukasz: Via my father and grandfather. I have always been with them, even as a child. 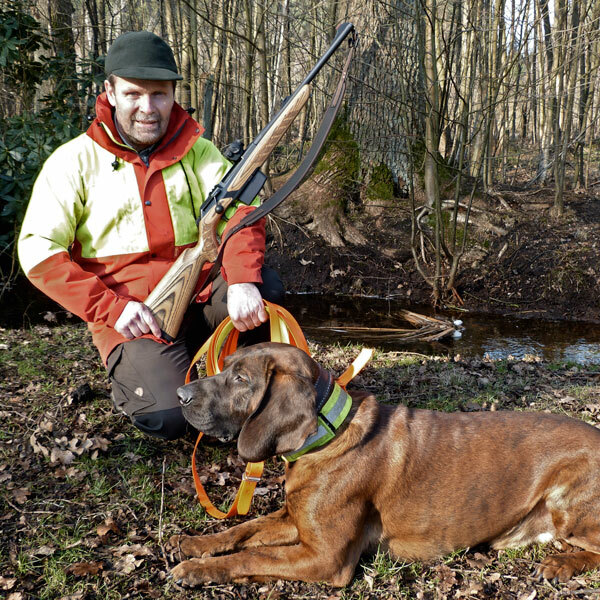 Lukasz: It is depending on the season – I like every type of hunting. 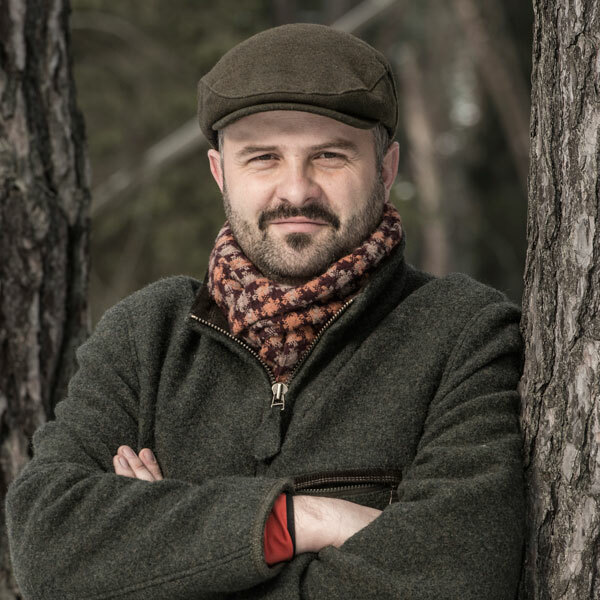 Lukasz: Roe deer and wild boar and I enjoy hunting at home the most – in Silesia. But it is always exciting to get to know new hunting grounds. Lukasz: Hunting has to be stunning.